Over 200 hard standing designated pitches. 7 days a week access. Coded entry system through electronically controlled sliding gates. CaSSOA Gold Award winning site. Size 20ft (6.06m) x 8ft (2.4m) x 8ft (2.6m) containerised storage. Able to store furniture of an average 3 to 4 bedroom house. Weatherproof, dry, tamper proof, lockable storage. 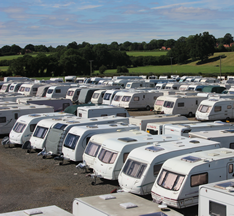 At Longpools Caravan Storage, we have provided secure storage solutions for caravans, motorhomes and boats for over a decade. Using a coded entry system and electronically controlled sliding gates, we offer our clients peace of mind with CaSSOA Gold Award winning security. Our insurance approved site has a fully alarmed, solid bunded, secure perimeter. We offer over 200 hard standing designated pitches and 16 undercover pitches. Access is available 7 days a week from 6am until 9pm; however, access out of hours can be arranged with advance notice. Conveniently located on the outskirts of the village of Hinstock in North Shropshire close to the Staffordshire border, we are approximately midway between Shrewsbury & Stafford and Wolverhampton & Chester. Our site is just 2 minutes from the A41; 20 minutes from the M54 and 30 minutes from the M6.